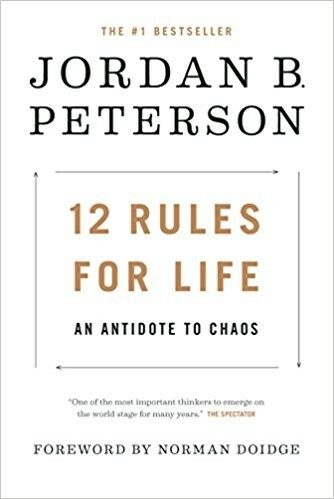 Finished Reading: 12 Rules for Life an Antidote to Chaos! What does everyone in the modern world need to know? Renowned psychologist Jordan B. Peterson’s answer to this most difficult of questions uniquely combines the hard-won truths of ancient tradition with the stunning revelations of cutting-edge scientific research. What does the nervous system of the lowly lobster have to tell us about standing up straight (with our shoulders back) and about success in life? Why did ancient Egyptians worship the capacity to pay careful attention as the highest of gods? What dreadful paths do people tread when they become resentful, arrogant and vengeful? 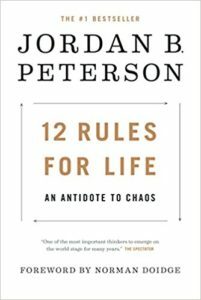 Dr. Peterson journeys broadly, discussing discipline, freedom, adventure and responsibility, distilling the world’s wisdom into 12 practical and profound rules for life. 12 Rules for Life shatters the modern commonplaces of science, faith and human nature, while transforming and ennobling the mind and spirit of its readers. Comments Off on Finished Reading: 12 Rules for Life an Antidote to Chaos! The majority of us confuse confidence for competence; it’s rather easy to misread confidence in others but there’s a steep price to pay for competence and most aren’t willing to pay it. Comments Off on Confidence or Competence? Although this research has been proven to be true countless times, there are many more animal products that cause cancer as well. Reduce your animal product intake and increase fresh vegetables and to a lesser extend fruits, legumes, raw nuts and whole grains. Processed meat, such as bacon or hot dogs, causes cancer, a World Health Organization group said in a long-awaited determination on Monday. The group said red meat, including beef, pork and lamb, probably causes cancer, too. Many studies show the links, both in populations of people and in tests that show how eating these foods can cause cancer, the International Agency for Research on Cancer (IARC) said in its report, released in the Lancet Medical Journal. “These findings further support current public health recommendations to limit intake of meat,” Dr. Christopher Wild, who directs IARC, said in a statement. Most reports on the links between meat and cancer have been softened with some element of doubt, but the IARC uses clear and direct language in saying processed meat causes cancer. There are no phrases such as “may cause” in the report. “Overall, the Working Group classified consumption of processed meat as ‘carcinogenic to humans’ on the basis of sufficient evidence for colorectal cancer,” the report reads. “Additionally, a positive association with the consumption of processed meat was found for stomach cancer. The Working Group classified consumption of red meat as ‘probably carcinogenic to humans’,” it added. “Red meat refers to unprocessed mammalian muscle meat—for example, beef, veal, pork, lamb, mutton, horse, or goat meat—including minced or frozen meat; it is usually consumed cooked,” the IARC said in its report. The report specifically names ham, hot dogs, sausages and jerky. It’s not startling news – the evidence has been building for years that eating meat, especially processed and red meat, raises the risk of cancer. It’s been linked with breast cancer colon cancer and may worsen prostate cancer. The IARC assembled a team of experts to review all the evidence. “The experts concluded that each 50 gram portion of processed meat eaten daily increases the risk of colorectal cancer by 18 percent,” the IARC said. “For an individual, the risk of developing colorectal cancer because of their consumption of processed meat remains small, but this risk increases with the amount of meat consumed,” said IARC’s Dr. Kurt Straif. Comments Off on Reduce Your Animal Consumption!